Free radicals are highly reactive and unstable molecules that are produced in the body naturally as a byproduct of metabolism (oxidation), or by exposure to toxins in the environment such as tobacco smoke and ultraviolet light. Free radicals have a lifespan of only a fraction of a second, but during that time can damage DNA, sometimes resulting in the mutations that can lead to cancer. 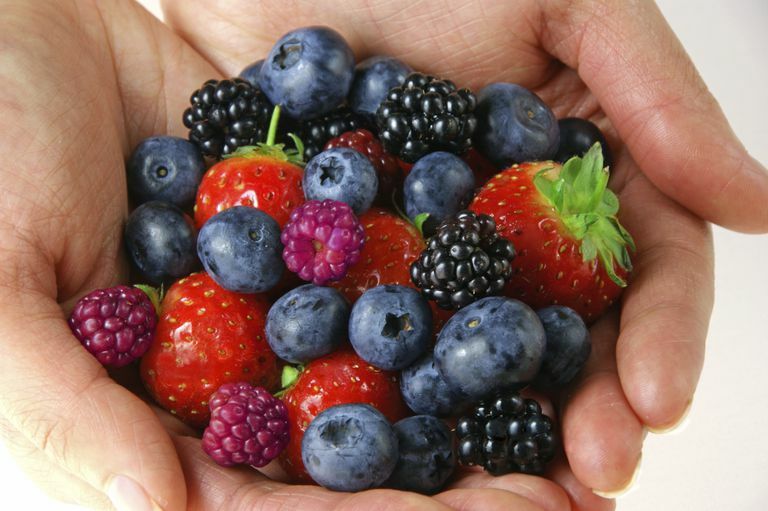 Antioxidants in the foods we eat can neutralize the unstable molecules, reducing the risk of damage. Free radicals contain an unpaired electron. Due to this lack of a stable number of outer shell electrons, they are in a constant search to bind with another electron to stabilize themselves—a process that can cause damage to DNA and other parts of human cells. This damage may play a role in the development of cancer and other diseases and accelerate the aging process. Free radicals may be produced in a few different ways. They may be generated from normal metabolic processes in the body, or by exposure to carcinogens (cancer-causing substances) in the environment. Our body often produces free radicals in the process of breaking down nutrients to create the energy which allows our bodies to function. The production of free radicals in normal metabolic processes such as this is one of the reasons that the risk of cancer increases with age, even when people have few exposures to cancer-causing substances. Once free radicals are generated, whether through an exposure or doing the normal processes of body metabolism, they are free to do damage. The availability of free radicals creates what is known as oxidative stress in the body. The reason it is named oxidative stress is that the reactions that occur which result in free radicals obtaining an electron are done in the presence of oxygen. Damage to proteins (protein cross-linking and more) and other body components may cause disease directly. Damage done to genes in the DNA may result in genes that produce ineffective proteins; proteins needed to be watchkeepers over the cells of the body. Some of these mutations may involve genes known as tumor suppressor genes.These genes code for proteins which function to repair damages in DNA or cause cells which are damaged beyond salvage to be removed through a process of apoptosis (programmed cell death.) The result is cells which are allowed to divide and become a tumor—the formation of a cancer cell. It is thought that antioxidants, such as vitamin C, vitamin E, and beta-carotene, may reduce the damage caused by free radicals in our bodies by inhibiting their formation. While dietary sources of antioxidants have been correlated with a lower risk of developing lung cancer, it is important to note that taking supplements of some of these (such as beta-carotene and vitamin E) may actually increase risk. For those who are going through treatment for cancer, it is very important to discuss any antioxidant supplements—or any supplements, for that matter—with your oncologist. Some treatments for cancer, such as radiation, create free radicals in an effort to kill cancer cells. In this setting, the use of antioxidants could, in theory, decrease the effectiveness of treatment. Cancer is usually caused by a series of mutations that result in the uncontrolled growth and relative immortality of the cell. Since fruits and vegetables in our diet are high in antioxidants, it's thought that this may be one reason why a diet rich in fruits and vegetables has consistently been associated with a lower risk of cancer. As noted earlier, however, getting these antioxidants in supplement form has not been found to be effective, and most oncologists recommend dietary sources of these nutrients. In addition, ​some vitamin and mineral supplements may interfere with cancer treatments. There are several theories describing why our bodies age and free radicals are included in one of those theories. Rather than free radicals being responsible for aging-related changes alone, however, it's likely that normal aging is related to a number of different processes in the body. Knowing how cancer can develop, individuals can look for ways in their lives to both reduce the free radicals produced in the body, as well as increasing the antioxidants available to cope with the free radicals which are produced even in normal metabolism. Check out these top 10 simple lifestyle changes you can begin today to lower your risk of developing cancer. As far as obtaining a healthy variety of antioxidants, experts in nutrition often recommend eating a "rainbow of foods" with different color foods often containing different classes of antioxidants. It's impossible to entirely eliminate the exposure to free radicals, especially those generated as as a result of normal metabolism in the body. That said, adopting a healthy diet rich in a wide variety of antioxidants is an excellent start. Lobo, V., Patil, A., Phatak, A., and N. Chandra. Free Radicals, Antioxidants and Functional Foods: Impact on Human Health. Pharmacognosy Review. 2010. 4(8):118-126.